Nowadays, sound security means more than just a home alarm or a smartphone app. Emergency or not, being able to access the professionals for immediate assistance and to prevent further damage or theft following a break-in provides a real sense of comfort. When crisis strikes and seconds count having your alarm monitored, with the option to request a professional security response puts home protection in your control. 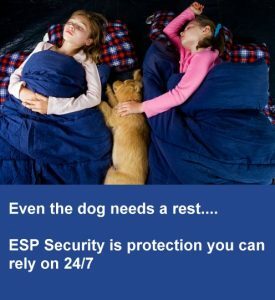 When you install a Monitored Alarm System from ESP security you can enjoy the reassurance that comes with having your property monitored 24/7 – no false alarms and direct Garda contact if required. With a monitored alarm system from ESP Security you can relax with the peace of mind that your loved ones and your home or business are protected every hour of the day, every day of the year. Homeowners across the country trust us as a leading security provider to protect their loved ones and their homes. We offer all the benefits of a national company but with a local presence. As a smaller company we can offer a better, more personal service and our lower overheads allow us to offer better value for money than the big nationwide security outfits.